Ken Kesey’s novel One Flew Over the Cuckoo’s Nest explores subjects such as freedom, systems of social control, sanity, and insanity. One Flew Over the Cuckoo’s Nest Analysis research paper due and don’t know how to start it? How about like this? 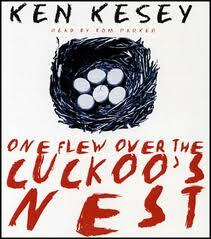 Ken Kesey’s novel One Flew Over the Cuckoo’s Nest explores subjects such as freedom, systems of social control, sanity, and insanity. The book takes place in an Oregon asylum and is narrated by Chief Bromden, a half-Native American man who has been diagnosed with schizophrenia. Chief, was he is known in the book, pretends he is mute and deaf to avoid contact with the asylum’s staff and other patients. Chief has reoccurring hallucinations of “the Combine,” a mechanized system that controls people in society. While Chief narrates the book, the story primarily focuses on Randle McMurphy, a rebellious convict who has faked insanity to avoid prison. McMurphy agitates the asylum’s system by questioning the authority of nurses, escaping from the institution, and trying to manipulate the other patients. He essentially fills the role of a cowboy or maverick bucking against a repressive system that prevents him from living fully as himself. In many respects, McMurphy represents the ideal of individualism in America. From the perspective of One Flew Over the Cuckoo’s Nest, though, this ideal is largely a myth because society is designed to foster conformism and prevent individualism. When McMurphy fails to conform, the head nurses (Nurse Ratched) subjects him to shock therapy and, finally, a lobotomy that steals his identity, showing that the system of control and power is much too strong for a single person to fight successfully. Paper Masters writes custom research papers on One Flew Over the Cuckoo's Nest Analysis and explore subjects such as freedom, systems of social control, sanity, and insanity.